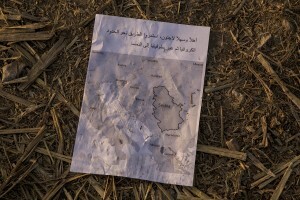 From September 15, 2015 about 8,900 refugees entered Croatia and the authorities announced that they will have to restore border controls if the flow will remain buoyant. Tovarnik train station is the point where migrants leave to Zagreb on their journey to reach the north Europe. A man with his son near Tovarnik train station where migrants leave to Zagreb despite moves by Slovenia and Hungary to hold them back in Tovarnik, Croatia on September 19, 2015. Migrants walk in a camp near Tovarnik train station in Croatia on September 20, 2015. From September 15, 2015 about 8,900 refugees entered Croatia and the authorities announced that they will have to restore border controls if the flow will remain buoyant. 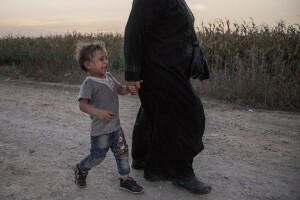 A Syrian woman with her daughter is seen near Tovarnik train station close to the croatian border with Serbia in Tovarnik, Croatia on September 18, 2015. Migrants washing their clothes near Tovarnik train station close to the croatian border with Serbia in Tovarnik, Croatia on September 18, 2015. Migrants try to get the train heading for Zagreb to continue their journey in the north of Europe despite moves by Slovenia and Hungary to hold them back in Tovarnik, Croatia on September 20, 2015. 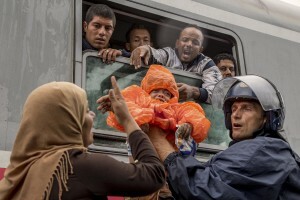 Police guard helps a baby to get the train heading for Zagreb as migrants desperately try to continue their journey in the north of Europe despite moves by Slovenia and Hungary to hold them back in Tovarnik, Croatia on September 20, 2015. 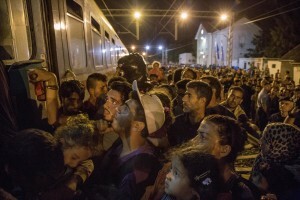 Migrants get on a train to reach Zagreb and continue their journey to the North Europe at Tovarnik train station in Tovarnik, Croatia on September 18, 2015. 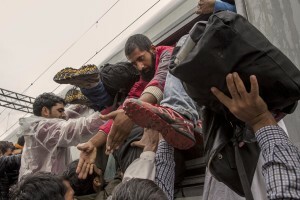 Migrants in Tovarnik train station getting on the train to continue their journey in the north of Europe despite moves by Slovenia and Hungary to hold them back in Tovarnik, Croatia on September 19, 2015. 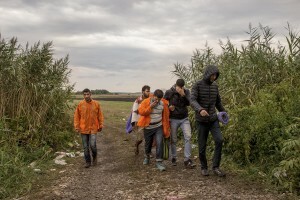 From September 15, 2015 about 8,900 refugees entered Croatia and the authorities announced that they will have to restore border controls if the flow will remain buoyant. 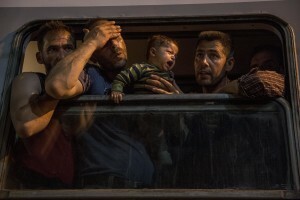 A man is in despair while his son cries after they have boarded on a train used by migrants to reach Zagreb and continue their journey to the North Europe at Tovarnik train station in Tovarnik, Croatia on September 18, 2015. Tovarnik, Croatia: A migrant sits down beside fire after heavy rain at Tovarnik train station in Tovarnik, Croatia on September 20, 2015. 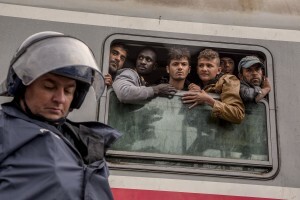 Tovarnik, Croatia: Police guard a train heading for Zagreb as migrants desperately try to continue their journey in the north of Europe despite moves by Slovenia and Hungary to hold them back in Tovarnik, Croatia on September 20, 2015. 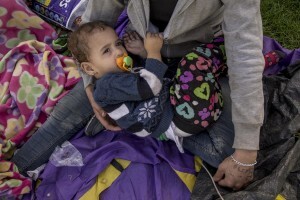 A mother carries her son who cries in a camp near the croatian border with Serbia in Tovarnik, Croatia on September 17, 2015.